MUNCY – Old School football was the name of the game between Muncy and Troy last night, a grueling 48 minutes of fast paced, hard-hitting action that any fan would want to watch in a high school football game. Ultimately Muncy pounded out its second win of the early season 31-21 over the Trojans, and looked like the team of veterans they wanted to be. Troy quickly set the fast-paced tone early when it went 65 yards down the field in six plays and two and a half minutes on their opening drive. Walker Kel­ly took a handoff straight up the middle for five yards to cap the scoring drive. Muncy then responded once it took the ball 60 yards and scored two minutes later when Colby Alpaugh rushed around the outside for a 19 yard score. Both teams went blow for blow in each of their first three drives. Early in the game Muncy’s defense had a tough time containing Troy’s triple-option offensive scheme, but settled down and adjust to find the ball and keep the damage to a minimum. “It was tough to emulate that in practice, for our guys to adjust out there like they did it was a great job.” Tetreault said. Offensively, Muncy found success running the ball and occasionally throw­ing a pass to keep Troy’s defense guessing. Senior running back, Alpaugh was called upon to lower his shoulder and churned out yards like he was on a mission. 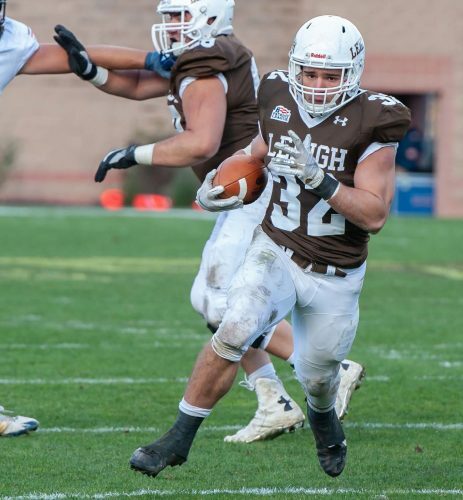 Alpaugh racked up 136 yards on 25 carries and 2 touchdowns, Michael Kus­tanbauter added 25 yards and another touchdown, and Cole­man Good had 28 rushing yards. “All summer we made an effort up front for our o-line to set the tone… it starts with Hunter Poust, James Yordy, Donovan Diehl, Dakota Haueisen, Jacob Whittaker, and Kolby Moyer at tight end. They block hard, any running back can run like that.” Tetreault said about the Indian’s offensive success last night. Both sides eventually tightened up defensively midway through the second quarter with Troy holding on to a 14-10 lead, until Coleman Good connected with Dylan Wilt on a two yard touchdown at the half going up 17-14 and with all momentum going into the locker room. From there Muncy ran away with the win. “The district championship really opened their eyes to see wat this team is about.” Tetreault said. “It was great to see all the work they put it finally translate to the field.” He continued. Even when Good threw an interception in the third quarter with the score still 17-10, Muncy never panicked, made Troy punt, and scored on their next possession on a one yard rush by Kustanbauter. “I told our guys it is our time to shine. We are ready to go.” Tetreault told his guys after the win. “Just fix the little things and get better every day.